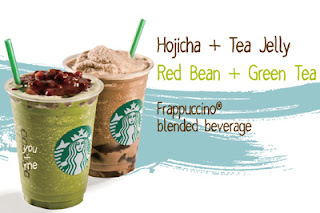 Starbucks is currently flogging what can only be described as a Hojicha and Earl Grey Tea Jelly Frappuccino. Say what you will about Starbies, they are nothing if not boundary-pushing. Don't forget to try the Green Tea and Red Bean Blended Beveraaaage. PS, can I interest you in a Frappuccino Dust Stopper Set? Do these things even exist in other countries?